Jon Hartle is the Liz Inwood Taildragger Scholarship 2018 Winner. The Vintage Aircraft Club was formed nearly fifty five years ago as a club for owners, pilots and enthusiasts of vintage and classic light aircraft. Currently the club has 350 members from across the UK and holds regular fly-ins, ground events and forums throughout the year. In common with many other aviation organisations the VAC is aware of a rapidly widening age gap within the membership. In order for the club to thrive and survive we are aware that we need to encourage and attract younger members to share our enthusiasm for flying vintage aircraft. It is also important that we pass on the skills to fly these aircraft which typically have the older type of conventional undercarriage – the taildraggers. 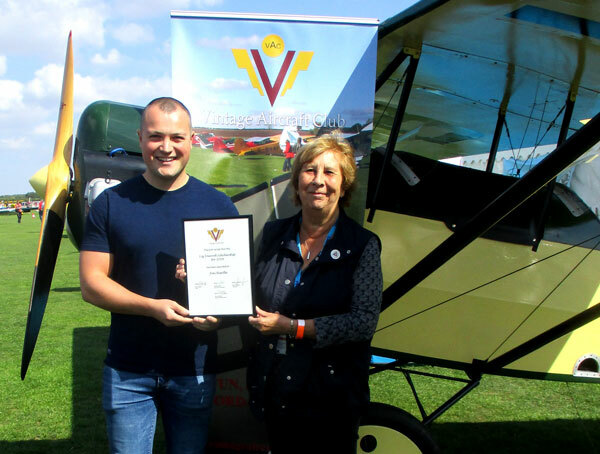 For this reason the Taildragger Scholarship was set up by the Liz Inwood Trust along with the VAC and we are pleased to make this annual award available to qualified pilots, under 36 years old, with 100hrs or more enabling them to train for up to 5 hours at a recognised flying school. Each year the selection panel will chose one pilot out of the many applicants. For 2017 winner see here. For 2016 winner see here. Applications for the 2018 Scholarship are now closed, but will re-open at the beginning of June 2019, so if you were unsuccessfull in 2018, you are welcome to apply by revisiting this page in June 2019.